From the actor who lived through it all and an award-winning narrative nonfiction writer: the inspiring and laugh-out-loud funny story of a mysteriously wealthy social misfit who got past every road block in the Hollywood system to achieve success on his own terms—the making of The Room, “the Citizen Kane of bad movies” (Entertainment Weekly). Nineteen-year-old Greg Sestero met Tommy Wiseau at an acting school in San Francisco. Wiseau’s scenes were rivetingly wrong, yet Sestero, hypnotized by such uninhibited acting, thought, “I have to do a scene with this guy.” That impulse changed both of their lives. Wiseau seemed never to have read the rule book on interpersonal relationships (or the instruc­tions on a bottle of black hair dye), yet he generously offered to put the aspiring actor up in his LA apart­ment. Sestero’s nascent acting career first sizzled, then fizzled, resulting in Wiseau’s last-second offer to Sestero of costarring with him in The Room, a movie Wiseau wrote and planned to finance, produce, and direct—in the parking lot of a Hollywood equipment-rental shop. Greg Sestero is a French-American actor, producer, and writer. He costarred in the cult phenomenon The Room. Tom Bissell is the author of several books and a winner of the Rome Prize and a Guggenheim Fellowship. He writes frequently for Harper’s and The New Yorker. "The Disaster Artist has to be one of the funniest, most deliciously twisted tales I have ever read. This extraordinary book is many things: a guide on how to succeed, sort of, in Hollywood; a life lesson in the virtues of deaf, dumb, and blind persistence; a very surreal variation on the archetypal American story of the immigrant dream. But at its heart lies the story of a deep and abiding friendship that survives against all odds, and the insanely bizarre film that stands as proof." "Finally, a hilarious, delusional, and weirdly inspirational explanation for the most deliciously awful movie ever made." "The Disaster Artist is not only the terrifically engaging tale of a bad Hollywood movie, it's one of the most honest books about friendship I've read in years." "Even if you haven’t seen Tommy Wiseau’s cult film phenomenon, The Room, it would be a mistake to not pick up The Disaster Artist. " "I laughed so hard reading The Disaster Artist that I cried." "A revelatory and moving look at both the man and the movie that have proved so fascinating for so many . . . filled with juicy, jaw dropping stories that are too good to spoil here. . . .You don't need to have seen The Room to love The Disaster Artist." "How bad is [The Room]? You should watch it and find out for yourself. 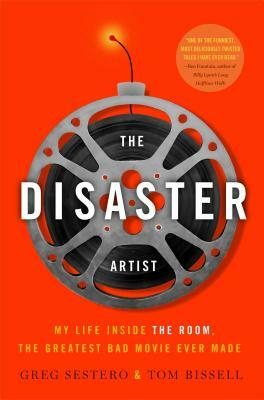 Then you should read actor Greg Sestero's tell-all memoir, The Disaster Artist, to find out how and why everything about the movie went so wrong. . . . Hilarious and surprisingly touching." "In The Disaster Artist, we learn some fascinating tidbits . . . [Sestero] is an engaging storyteller who takes us from football games in Golden Gate Park to ludicrous parking lot film shoots, peppering the journey with whip-smart insights and laugh-out-loud jokes." "The book's behind-the-scenes tales are so outsized that they are due to become part of movie-making lore." "Downright thrilling . . . a making-of book like no other." "Funny, engaging first-person account of the making of The Room. . . . A deft, energetic narrative . . . an improbably resonant tale of warped creativity and friendship." "Make no mistake about it: The Disaster Artist is terrific. Every page is a treasure that reveals more background information for one of cinema's famous train wrecks." "Hysterical . . . a terrific sense of humor is the book's greatest asset." "Hilarious, and often poignant . . . If you're a fan of The Room, or if you're just looking for a memoir unlike any you've ever read, don't hesitate to pick up this book." "A human drama that's compulsively readable, a tale of men whose bond allows them both to stumble their way into cinema history." "One of the worst movies of all time has spawned one of the most entertaining books I've read in years. It's a happy ending worthy of Hollywood." "A surprising, hilarious and compelling account of the making of the modern Plan 9 from Outer Space."